12|31|2009 - a happy 2010! After some busy time here is a little spontaneous update for the undecided deejays among you looking for one or two tunes to spice up your club / house / electroclash set this or next night (or both ;)). Some of the tracks are a bit older, but they all do very fine in heating up every crazy crowd of clubbers and dance devils that yearn for some awesome, ill-driving stuff. You cannot do anything wrong with these really..
Party on, edm lovers. 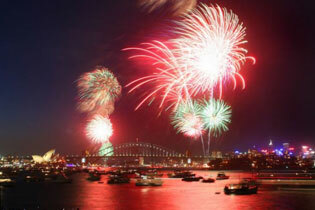 Let’s enjoy a special time whereever you are celebrating! No, we have not quit service (though it almost seemed so over the last months). Nevertheless, hh never has averted its gaze off the vividness and sometimes hard-to-witness progress of the electronic music scenery. We have eagerly and ambitiously looked out for the most captivating, refreshing and also timeless tracks released by both respective and promising artists new to the realm of edm. However, not all of these pearls have been added to the online database and to our alpha list accordingly. Approximately, far over 70 wonderful to excellent productions still have to be inserted. This can be a time-stealing job sometimes as the secondary information especially regarding brandnew or even unreleased tracks is often hard to retrieve and/or uncertain. Moreover, hh wants to live up to the expectations you shall have of a review and recommendation project that puts maximum effort into a fair, detailed and adequate evaluation of every piece of music that reaches us from worldwide quality sources. At the moment, it can only be promised that all those beautiful tunes will be added step by step. Just take a look at the monthly alpha newentries from time to time. 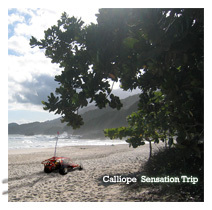 05|28|2009 - download [updated]: cut of new tune "Bali Nights" by Calliope! After "Sensation Trip" here comes an exclusive 3 mins preview of the follow-up most likely being called "Bali Nights" - an exotic, moody, relaxed chill-out dance track for endless nights at the beach or pleasant rides through the countryside.. ;) Keep in mind: This is only an imperfect, unprecise, incomplete cut for home listening pleasure to (hopefully) sweeten the waiting time. Feedback is welcome! 05|23|2009 - download: full-length version of new Calliope tune! It took some hard weeks of acribic work for Olli, the creator of this site, to produce his first tune after a longer time period. The self-composed track - a mid-tempo epic trance number with elements of ambient and chill-out - is about to be finished within days or few weeks from now. heavenly-hymns.de is now happy to present a first "semi-live" (due to missing MIDI support) full-length version of the track with the former working title "Nightdrive" (see previous news). Much has happened in the meantime so that also the tune’s stylistic and thematic focus changed drastically. After radical cuts and rearrangements the first idea for a title had been "Sylvan Bay Ride" which was based on the creator’s associations with a dune buggy ride along the beachline of an abandoned wooden bay. Due to its rather experimental and quite complex character with many manyfold moods and feelings expressed throughout the track however Olli considers to rename it to "Sensation Trip" until further notice. Other conceivable/suitable titles could be "Sundry Visions" as the track somehow takes you onto an intense emotional journey, or - to account for the story-telling of the tune - "Mind Tales". Finally, here’s a short cut from the mentioned new Calliope track by Olli. Download it now (for free of course), enjoy and send your opinion to feedback [-at-] heavenly-hymns [-.-] de - your comments are welcome as always! A month has passed and Olli managed to invest some time in the new Calliope track (see last news below). Many new ideas came up and changed quite a lot of the tune’s structure, atmosphere and intention. 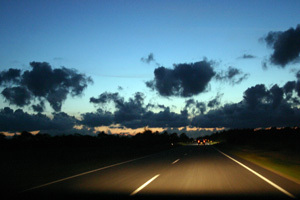 Olli also came to the conclusion that the title Nightdrive doesn’t really hit the nail on the head although it is used as a "working title" until the final one is presented with the production being completed. Actually, I wanted to present a little sound teaser of the track right now, but - you won’t;t believe it - my elder soundcard isn’t really supported by my new operating system and that is why I’m presently awaiting a (even more professional) new external audio interface enabling me to make and provide a much better recording to download from heavenly-hymns.de or to stream via the heavenly-hymns myspace. Of course, the rest of the story about Olli’s old producing ambitions as well as idea and intention regarding the newest "baby" will be presented as promised here in the news section together with the download link. Thanks a lot for all your patience with our website in the last weeks and months as there was much to do apart from the heavenly hymns project. Although this will remain so further, we try to provide as many updates (esp. list updates) as possible - we know there have been many gorgeous releases recently of which the best will be added successively. However, a small number of excellent tunes have been added to the alpha list - enjoy them, play them in your sets, support the artists! ;) for now: happy Easter and all the best! For everybody who thought heavenly-hymns.de was only about reviewing electronic dance music here comes the disillusioning message that Olli (the founder of this web project) has a weakness for composing electronic music since he began to discover functions on his first home computer, the legendary A500 by Commodore(tm) that outreached mere gaming capabilities. That was 1995 at the innocent age of 14 (okay, cross out "innocent" =]). Some closer friends certainly know this, and maybe (I hope so ;)) they also remember the last (and first more or less professional < I hope so, too) tune called Cameroon - also under the pseudonym Calliope which, too, was never released, unfortunately. Now that a longer period has passed in which I haven't found the time to occupy myself with the passion and to improve composition skills (instead I preferred to focus on making live music for my own with a keyboard and sometimes a synth to train and directly implement my ideas) I am very happy to announce Nightdrive which I am currently working on. 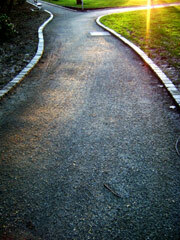 Of course, a teaser of the tune is put online in the next days - here at heavenly-hymns.de and also at the hh myspace. I hope very much that you will give it a chance and that you can enjoy it. Nightdrive is again written with much effort and passion. January and february held a big bunch of crushing starters into the new year, the flood of exciting tunes is quite impressive and also a reason for the rather sluggish update process. Many of the tracks that arrived heavenly hymns in the past weeks still have to be listened to. Now, the selection of the most outstanding tracks is going to be added step by step. But whereto is edm probably navigating, what will be the decisive and formative developments, stylistic additions and "subdefinitions"? Anyway, minimal sounds and trashy electro snippets continue their (triumphal?) procession and often get mixed up with traditional elements of trance, progressive styles and dream house. So nothing really new beyond this brief description of the contemporary status? Well, not nothing. There is no need to fall into despair for the fans of more well-harmonized ear-pleasant definitions of edm: There are also well-tempered emeralds gleeming down there in the sea that can be assigned to a more moderate style, yet none the less exciting! Once again, heavenly-hymns.de are more or less forced to do the splits between those more moderate, well-arranged and well-harmonized pieces on the one hand and that new way of playing with heavy edge, dirty elements such as sample trash, sawtooth waves, lots of distortion and so on. More and more, heavenly-hymns.de has to deal with "stylistic hermaphrodites" rendering evaluation increasingly difficult and - frequently and sometimes drastically - extending the spectrum of styles and musical definitions the project aims to cover. Contrariwise, the "mission" becomes more and more exciting and it is absolutely overwhelming to see how this category of music has generated and developped all those subgenres with their characteristics and distinct stylistic elements in the course of time. Certainly, among all the delectable progressions and formations under the umbrella, the present trend or "sound fashion" described has been identified as the most challenging one. The project regards those "dirty", "trashy", "chaotic" influences as typical tendencies of a highly progressed evolution and in its core very comprehensable. It was just a question of time to see artists dress themselves in clothes of craziness, madness, nastiness etc., and sometimes also bath in exaggeration and flamboyancy shockingly often not fearing disgrace and a loss of authenticity their previous more or less nice and substantial work. This is the curse of such a vast and technically highly developped music (taking to play the role of a "formula one" of music) and the proliferation of cheap or free, (semi)professional applications and tools for the making of electronic music within the networks and cooperational possibilities of the web 2.0. Software and hardware technologies become ever easier and more intuitive to use without the necessity to get lost in big manuals or become a something like a professional sonic engineer, and also to make programs and devices affordable for a stunningly great number of young, creative and tech-enthusiastic people thus enabling them to contribute myriads of ideas and upload their unsigned productions to the known communities and platforms of the new "websciety". The side effect of this welcome as well as extremely confusing and rather "unprofessionalizing" phenomenon is a tremendous accelaration of musical production output and the exercizing all aspects and pulling out all the stops of edm production just supporting and being symptomatic for the totally crazy and overfraught part of the world we live in today. Again: no need to fall into despair! hh will keep the eyes open and give new influences a chance as long as they follow high quality standards the project demands since its beginning, you know it. Since 1999 we are mesmerizing what may "quasi-objectively" be referred to as the nonplusultra in EDM (electronic dance music). Our very ambitious, non-commercial service focusses on a broad spectrum of styles between Trance, Progressive, Deep House, Dream House, Breaks and also melodic/danceable Ambient and Chill-Out. With (atm) over 1800 cutting-edge productions covering the whole history of pathbreaking dance electronica since the early days of the raving society, the project has matured to a fountain of inspiration and creativity with its first class recommendations for your private listening pleasure, the small party next door or even the real big events. From the very beginning heavenly-hymns.de has persued some core principles, which are to provide reliable information and recommendations on tracks, artists, scene/culture and even some events/locations, remarkable lyrics and edm-related weblinks collection, all on a non-commercial basis "FROM the scene FOR the scene" open to EVERY person and for both newbies and advanced listeners of this kind of music. trance DJs progressive artists breaks productions tech-trance tunes hymns dream tracks heavenly chill-out house and ambient, nothing less than the best and the cream of intelligent and captivating, smart, legendary edm highlights that are of cutting-edge quality for your clubbing and homelistening pleasure. solid sonic golden visionary masterpieces and milestones, aural gems and jewels for global gatherings and celebrations of a big society. The happy, melodic, epic, intoxicating, thrilling anthems listed on this project site are simply amazing, uplifting, upfront, fascinating, mindblowing, pathbreaking - sonic pleasures and tresures. Exciting captivating trance and progressive.